The Lenovo ThinkSystem SD530 is an ultradense and economical two-socket server in a 0.5U rack form factor. With four SD530 server nodes installed in the ThinkSystem D2 enclosure, and the ability to cable and manage up to four D2 enclosures as one asset, you have an ideal high-density 2U four-node (2U4N) platform for enterprise and cloud workloads. This product guide provides essential presales information to understand the SD530 node and D2 enclosure, their key features and specifications, components and options, and configuration guidelines. This guide is intended for technical specialists, sales specialists, sales engineers, IT architects, and other IT professionals who want to learn more about the SD530 and consider its use in IT solutions. The Lenovo ThinkSystem SD530 is an ultradense and economical two-socket server in a 0.5U rack form factor. With four SD530 servers installed in either the ThinkSystem D2 Enclosure or ThinkSystem Modular Enclosure, you have an ideal high-density 2U four-node (2U4N) platform for enterprise and cloud workloads. 2U4N systems have gained popularity in a variety of data centers, from large enterprises to service providers, because their small footprint and inherent density make them ideal for building solution-based appliances at a low cost. The combination of the Lenovo ThinkSystem SD530 and D2 Enclosure is engineered to deliver these types of solutions. The following figure shows four ThinkSystem SD530 servers installed in a D2 Enclosure. 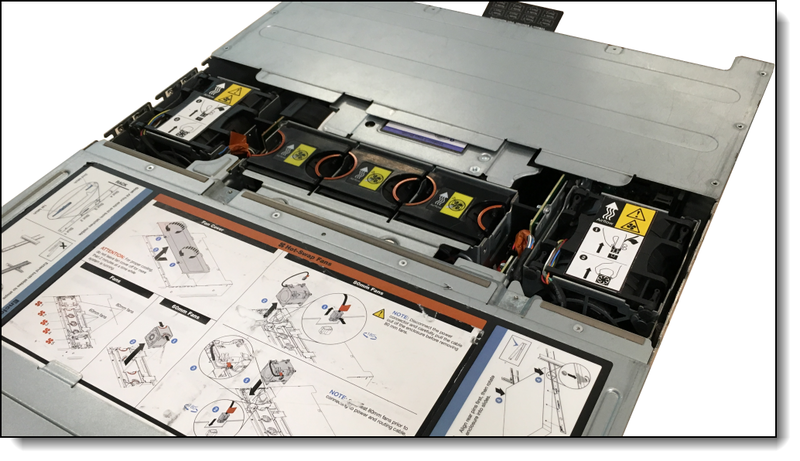 The SD530 combines the efficiency and density of blades with the value and simplicity of rack-based servers. It is designed to run the highest-core-count Xeon Platinum processors, to power through your most demanding HPC/technical computing/AI workloads. The SD530 also supports two high-performance GPUs with the addition of the GPU Tray. The server supports a wide variety of NVIDIA GPUs. The ThinkSystem SD530 dense offering fits four hot-pluggable SD530 servers into a ThinkSystem D2 Enclosure or ThinkSystem Modular Enclosure. The enclosures each take up only 2U (0.5U per server) and include room for plenty of internal storage. The overall design makes the solution extremely affordable, with a low total cost of ownership (TCO). Up to four nodes in a single 2U enclosure, each with two processors from the Intel Xeon processor Scalable family, up to 16 DIMMs, 6 drive bays, and two PCIe slots. It is a highly dense, scalable, and price-optimized offering. Supports a wide selection of processors from the Intel Xeon processor Scalable family - designed to operate with the cost-effective Bronze processors up to the highest-core-count Xeon Platinum processors. Supports processors with up to 28 cores, core speeds up to 3.6 GHz, and TDP ratings up to 165W. Two processors in each server, up to 56 cores total, and 112 threads maximize the concurrent execution of multithreaded applications. With four nodes in the enclosure, a total of 224 cores are available in only 2U of rack space. Supports up to 16 DIMMs to maximize memory capacity, supporting 1 TB using 16x 64 GB LRDIMMs or 1.5 TB using 12x 128 GB 3DS RDIMMs. Supports up to two GPUs with the addition of a 1U GPU Tray, providing increased processing power. The 12 Gbps SAS internal storage connectivity doubles the data transfer rate of 6 Gb SAS solutions, to maximize performance of storage-intensive applications. Each SD530 server supports up to six 2.5-inch hot-swap drives. Two drive bays can be configured to support NVMe drives to maximize I/O performance in terms of throughput, bandwidth, and latency. With 7.68 TB 2.5-inch SAS hot-swap SSDs, each SD530 supports up to 46 TB of internal storage. The server has two optional 10 Gb Ethernet ports, either 10GBASE-T or SFP+, routed from the embedded X722 controller to the optional 8-port EIOM module at the rear of the enclosure. One PCIe 3.0 x16 or two PCIe 3.0 x8 slots for added I/O flexibility. Supports Secure Boot to ensure only a digitally signed operating system can be used. Supported with HDDs and SSDs as well as M.2 drives in the M.2 Adapter. With the SMM management module installed in the enclosure, only one Ethernet connection is needed to provide remote systems management functions for all four SD530 servers and the enclosure. The enclosure also supports the Dual Ethernet Port SMM management module with allows a single Ethernet connection to be daisy chained across 7 enclosures and 28 servers, thereby significantly reducing the number of Ethernet switch ports needed to manage an entire rack of SD530 servers and enclosures. High-efficiency power supplies with 80 PLUS Platinum certifications. Energy Star 2.1 certified. SSDs use as much as 80% less power than 2.5-inch HDDs. The D2 Enclosure and Modular Enclosure both support two hot-swap power supplies, which form a redundant pair to provide availability for business-critical applications. Toolless access to upgrades and serviceable parts, such as fans, adapters, CPUs, and memory. Proactive Platform Alerts (including PFA and SMART alerts): Processors, voltage regulators, memory, internal storage (SAS/SATA HDDs and SSDs), fans, power supplies, RAID controllers, and server ambient and sub-component temperatures. Alerts can be surfaced through the XClarity Controller (XCC) to managers such as Lenovo XClarity Administrator, VMware vCenter, and Microsoft System Center. These proactive alerts let you take appropriate actions in advance of possible failure, thereby increasing server uptime and application availability. Support for the XClarity Administrator Mobile app running on a supported smartphone and connected to the server through the service-enabled USB port, enables additional local systems management functions (requires the optional KVM Breakout Module). Three-year customer-replaceable unit and onsite limited warranty, 9 x 5 next business day. Optional service upgrades are available. The following figure shows the front of the D2 Enclosure. The front view shows the four SD530 nodes, each with 6 drive bays. The following figure shows the rear of the D2 Enclosure. The following figure shows the I/O shuttle removed from the rear of the D2 Enclosure. The fans are hot-swap and are accessible from a removable cover on the top of the enclosure. 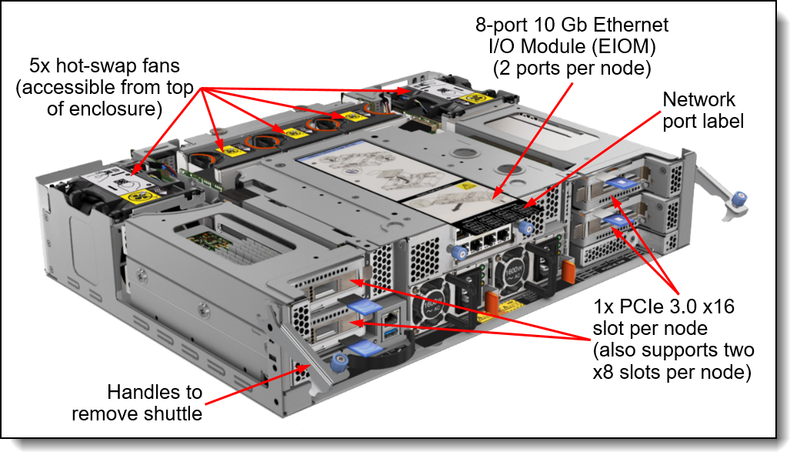 The following figure shows the front of the SD530 server. The following figure shows the internals of the SD530 server identifying key components. 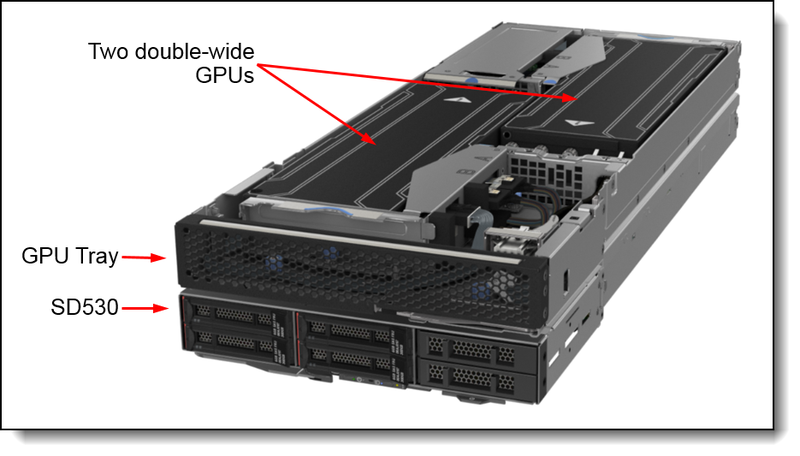 The SD530 also supports the addition of a GPU Tray which adds support for two double-wide GPUs, as shown in the following figure. The following table lists the standard specifications of the ThinkSystem SD530. Form factor Half-wide, 1U compute node. Optional GPU Tray adds 1U. Supported chassis ThinkSystem D2 Enclosure, 2U high; up to 4 servers per chassis. ThinkSystem Modular Enclosure, 2U high; up to 4 servers per chassis. Processor One or two Intel Xeon Processor Scalable Family processors, either Bronze, Silver, Gold or Platinum level processors (formerly codename "Skylake"). Supports processors with core counts up to 28 cores, core speeds up to 3.6 GHz, and TDP ratings up to 205W. Two Intel Ultra Path Interconnect (UPI) links at up to 10.4 GTps each. Support Lenovo TruDDR4 DIMMs at up to 2666 MHz. RDIMMs, LRDIMMs and 3DS RDIMMs are supported, but memory types cannot be mixed. Storage bays Up to six 2.5-inch hot-swap drive bays. Depending on the drive backplane selected, the supported drives can be SAS, SATA or NVMe drives. Up to four NVMe drives can be installed with a suitable drive backplane. Also supports one or two M.2 drives installed internally to each node. Other configurations exist including the substitution of a KVM Module in one drive bay for keyboard, video and mouse support. See the Internal storage section for details. Storage controller Onboard 6 Gb SATA using embedded Intel RSTe software RAID, supporting RAID 0, 1, 10, 5, 50. Optional 12 Gb SAS/SATA RAID using SAS3408-based cacheless RAID controller, supporting RAID 0, 1, 10, 5. Optional 12 Gb SAS/SATA HBA. Optical drive bays No internal bays; use an external USB drive. Two 10 Gb interfaces, either 10GBASE-T ports (RJ-45) or SFP+ ports, routed through the Ethernet I/O Module at the rear of the enclosure. Networking ports are based on the Intel Ethernet Connection X722 in the chipset of the SD530 node. Front: Optional KVM Breakout Module providing one USB 3.0 port, one micro USB port for XClarity Controller connectivity, and a KVM connector port for a breakout cable that provides one VGA port, two USB 2.0 ports and one DB9 serial port for local connectivity. Additional ports provided by the enclosure as described in the Enclosure specifications section. Cooling Supplied by the D2 Enclosure. Power supply Supplied by the D2 Enclosure. Operator panel with system error LED and ID and power controls. XClarity Controller embedded management, XClarity Administrator centralized infrastructure delivery, XClarity Integrator plugins, and XClarity Energy Manager centralized server power management. Optional XClarity Controller Advanced to enable remote control functions. System Management Module (SMM) in the D2 Enclosure provides additional systems management functions. Security Power-on password, administrator's password, Trusted Platform Module (TPM), supporting TPM 1.2 or TPM 2.0. In China only, optional Trusted Cryptographic Module (TCM). The SD530 servers are supported in both the ThinkSystem D2 Enclosure and ThinkSystem Modular Enclosure. The following table lists the standard specifications of the enclosures. Tip: The only difference between the D2 Enclosure and the Modular Enclosure is that the D2 Enclosure has a single-port SMM management module and the Modular Enclosure has a dual-port SMM management module. Form factor 2U rack-mounted chassis. Server support Up to 4 servers per chassis. The hot-swappable System Management Module (SMM) is the management device for the enclosure. Provides integrated systems management functions and controls the power and cooling features of the enclosure. Provides remote browser and CLI-based user interfaces for remote access via the dedicated Gigabit Ethernet port. Remote access is to both the management functions of the enclosure as well as the XClarity Controller (XCC) in each server. Supports the SMM with one Ethernet port (D2 Enclosure) or the Dual Port SMM with two Ethernet ports (Modular Enclosure, or the D2 Enclosure with the Dual Port SMM installed). The Dual Port SMM allows a single incoming Ethernet connection to be daisy chained across 7 enclosures and 28 servers, thereby significantly reducing the number of Ethernet switch ports needed to manage an entire rack of SD530 servers and enclosures. Ethernet I/O Module 8-port Ethernet I/O Module (EIOM) routes two 10 GbE connections to each of the four servers. Power supplies Two hot-swap power supplies either 1100 W, 1600 W, or 2000 W functioning as a redundant pair. Power supplies must be identical. Power supplies require a 200-240 V ac, 50 or 60 Hz supply, although the 1100 W also supports 100-127V ac 50 or 60 Hz. Power supplies are installed at the rear of the chassis. 80 PLUS Platinum certified. Built-in overload and surge protection. Cooling Five hot-swap system fans, accessible via removable panel in the top cover of the enclosure. Limited warranty Three-year customer-replaceable unit and onsite limited warranty with 9x5/NBD coverage. SD530 server models are country-specific; that is, each country may define their own server models, and not all server models are available in every country. This section lists the available models. Information on the models is also available on the PSREF website, http://psref.lenovo.com. The following table lists the base CTO models of the ThinkSystem SD530 server. Up to four SD530 servers are supported in a D2 Enclosure or a Modular Enclosure. The following table lists the base CTO models of the enclosures. The preconfigured D2 Enclosure models and Modular Enclosure models are listed in the following table. Refer to the Enclosure specifications section for information about standard features of the enclosure. The SD530 is supported in all models of the D2 Enclosure or Modular Enclosure. The number of servers that are supported in each chassis depends on the TDP value of the processors that are used in the servers, the number and capacity of power supplies installed (1100W, 1600W or 2000W), and the AC input voltage (100 - 127V or 200 - 240V). The enclosure supports oversubscription and power supply redundancy options to ensure efficient use of the available system power. By using oversubscription, users can make the most of the extra power from the redundant power supplies when the power supplies are in healthy condition. System power consumption is highly dependent on configuration, workload, and ambient temperature. Lenovo recommends that customers use Lenovo Capacity Planner to select the power supplies best suited for their deployment requirements. The SD530 supports the processor options listed in the following table. Processors with the T suffix have more robust thermal characteristics (higher T-case). Processors with the M suffix support support greater than 768 GB per processor. 105mm heatsinks are used on CPU 1 when the processors installed have medium thermal requirements. Due to its shape, this heatsink limits the number of DIMMs to 12. A storage adapter can be used with these processors. Only CPU 1 (rear) needs this larger heatsink; CPU 2 (front) uses an 85mm heatsink. Thermal Transfer Module heatsinks are used on CPU 1 when the processors installed have high thermal requirements. 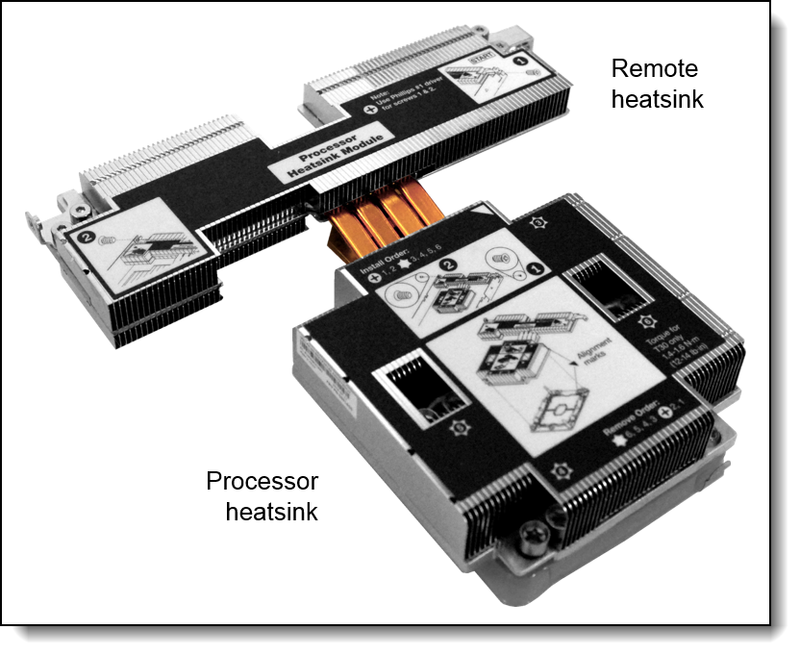 The Thermal Transfer Module is two heatsinks connected together via thermal pipes as shown in the following figure. Due to its shape, this heatsink prevents an adapter (RAID or HBA) from being installed in PCIe slot 1 at the rear of the server and limits the number of DIMMs to 12. CPU 2 will use a larger 102mm heatsink in such configurations. The Thermal Transfer Module (TTM) heatsink is shown in the following figure. For additional information, see the Lenovo Press article, The Benefits of Lenovo Thermal Transfer Module Technology in ThinkSystem SD530 Servers, https://lenovopress.com/lp0922. The following table lists the heatsink used for each processor model, and the resulting support for 16 DIMMs and support for a RAID adapter or HBA. The table also lists which processors (those with an M suffix) that support more than 768 GB per processor (1.5TB for two processors). 16 DIMM support: The use of 16 DIMMs requires that smaller heatsinks be used. As a result, only a subset of processors support 16 DIMMs (8 DIMMs per processor), as noted in the table below. All others are limited to 12 DIMMs (6 DIMMs processors). Drive bay support: Only a subset of processors support 6 drive bays. See the Drive bays and backplanes section for details. Storage adapter support: Some procesors require the larger T-shaped Thermal Transfer Module heatsink which precludes the use of the RAID adapter or HBA installed in the dedicated slot at the rear of the server. † With 16 DIMMs, drive bays are limited to 4x 2.5-inch SAS/SATA drives or 4x 2.5-inch NVMe drives (6 drive bays not supported). See the Drive bays and backplanes section for details. The SD530 server supports TruDDR4 memory. TruDDR4 memory uses the highest-quality components sourced from Tier 1 DRAM suppliers and only memory that meets strict requirements is selected. It is compatibility tested and tuned to maximize performance and reliability. Each processor has six memory channels. All DIMMs operate at a speed of 2666 MHz. However, if the processor selected has a lower memory bus speed (eg 2400 MHz or 2133 MHz - see the Processor options table), then all DIMMs will operate at that lower speed. The SD530 supports up to 6 or 8 DIMMs per processor, for a total of 12 or 16 DIMMs when two processors are installed. The total DIMMs supported depends on the processor selected, as described in the Processor options section. The following table lists the memory options that are available for the SD530 server. * Some SD530 configurations only support 6 DIMMs per processor (12 total) depending on the processor selected, as described in the Processor options section. † 12 is the effective maximum number of 128 GB DIMMs that the SD530 supports, since using any more than 12x 128 GB DIMMs requires an M-suffix processor, and the heatsink required for all M-suffix processors prevents more than 12 DIMM slots. It is supported to mix x4 and x8 DIMMs. Only a subset of the supported processors can be used, as indicated in the Processor specifications table in the Processor section. Smaller processor heatsinks will be automatically selected by the configurator so that the four additional DIMM slots are accessible. Only the 2x2 SAS/SATA backplane can be selected as described in the Drive bays and backplanes section. The 2x3 backplanes are not supported and no NVMe drives are supported. Each processor has 6 memory channels. As a result, for best performance, populate memory DIMMs in quantities of 6 or 12 per processor, so that all memory channels are used, however, to maximize capacity, select a processor that in the SD530 supports 8 DIMMs per processor and install 16 DIMMs. If memory rank sparing is used, then a minimum of one quad-rank DIMM or two single-rank or dual-rank DIMMs must be installed per populated channel (the DIMMs do not need being identical). In rank sparing mode, one rank of a DIMM in each populated channel is reserved as spare memory. The largest rank in the channel will be automatically selected as the spare rank. The amount of memory available to the operating system depends on the number, capacity and rank counts of the DIMMs installed. 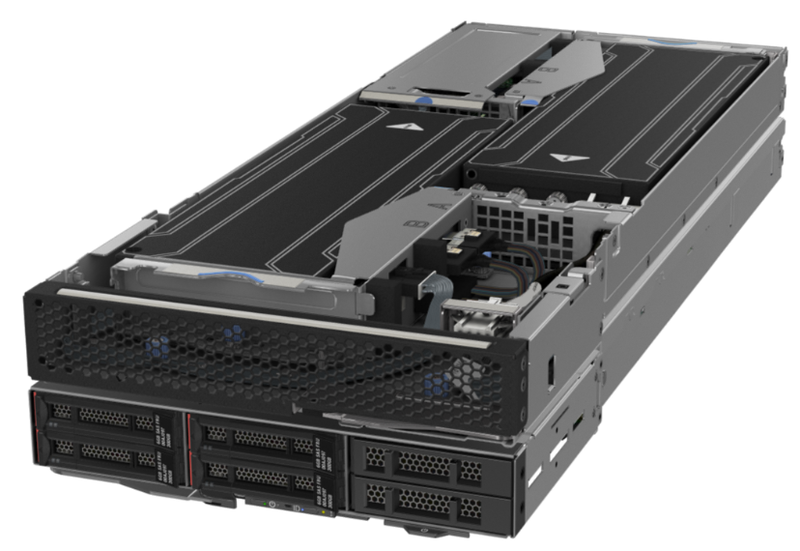 The SD530 supports up to six 2.5-inch hot-swap drive bays, all of which are accessible from the front of the server. Five drive bays, three of which are SAS/SATA and two are AnyBay bays. This configuration also includes a KVM breakout module to provide front-accessible VGA, Serial and USB ports. Four drive bays, all of which are SAS/SATA drive bays or all of which are NVMe. These configurations also support an optional KVM breakout module. The three configurations are shown in the following figure. When the AnyBay backplane is selected the rightmost two drives are the AnyBay drive bays. 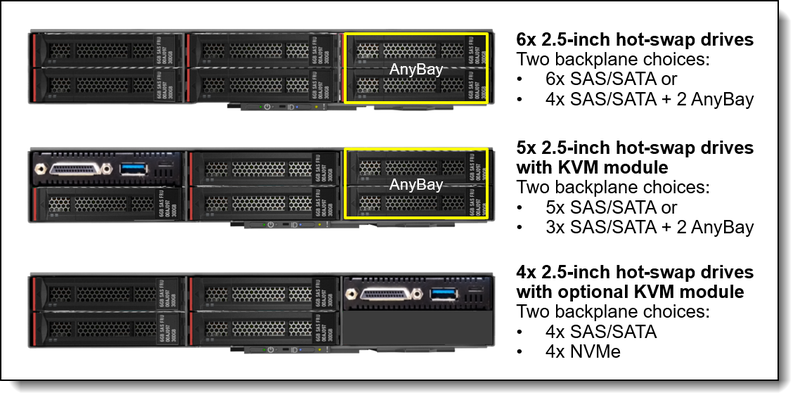 Tip: AnyBay is the term for a bay with a U.2 connector that has both SAS/SATA and NVMe connections. It is designed to support either a SAS, SATA or NVMe drive. The drive bay configurations are made available through the use of either a 2x3 SAS/SATA backplane, 2x3 AnyBay backplane, a 2x2 SAS/SATA backplane or a 2x2 NVMe backplane. Ordering details are listed in the following table. Processor 2 needed for AnyBay: The use of AnyBay or NVMe requires that processor 2 be installed. Processor 2 provides the necessary PCIe connectivity. Not all processor selections support the 3x2 backplanes, and some ony support 3x2 backplanes when 12 DIMMs are installed. The following table shows the supported combinations. Tip: Support is based on the cooling needs of the processor, not the TDP or core frequency. PCIe NVMe connectivity for the AnyBay backplane from the PCIe connector #3 on the system board which is routed from Processor 2. PCIe NVMe connectivity for the 2x2 NVMe backplane from the PCIe connectors #3 and #4 on the system board which is routed from Processor 2. These connectors are shown in the Internal view of the server in the Components and connectors section. Tip: The controllers are described in detail in the Controllers for internal storage section. Storage adapters with high-end processors: The use of processors with a high thermal profile such as the 205W processors preclude the use of the RAID adapter or the HBA. See Processor options for specifics. With such processors, only the onboard Intel RSTe 6 Gb SATA software RAID controller can be used. Virtualization support: The onboard SATA ports can be used with virtualization hypervisors, including VMware ESXi, Linux KVM, Xen, and Microsoft Hyper-V, however support is limited to AHCI (non-RAID) mode. RSTe mode is not supported with virtualization hypervisors. The following table lists the ordering information. ** The SAS/SATA HBA supports SEDs (self-encrypting drives) by using software on the server and simply passing SED commands through the HBA to the drives. The I/O slots for the SD530 nodes are housed in the I/O shuttle in the rear of the enclosure. See the Components and connectors section for the location. The following figure shows the locations of the slots. Adding or replacing an adapter in the x16 slot only requires the one SD530 node to be powered off. The other three servers can remain fully operational. Adding or replacing an adapter in any x8 slot requires that all four SD530 nodes be powered off. The SD530 also supports the addition of a GPU Tray with two full-length full-height slots. Details about the GPU Tray are in the GPU Tray and GPU adapters section. SharedIO is a new feature of the SD530 which implements Mellanox Multi-Host technology. With SharedIO, a Mellanox VPI adapter is installed in a slot in one SD530 server and an auxiliary adapter is installed in a slot in second server in the same enclosure. The result is that the two servers share the network connection of the VPI adapter with significant savings both in the cost of the adapters but also the cost of switch ports. 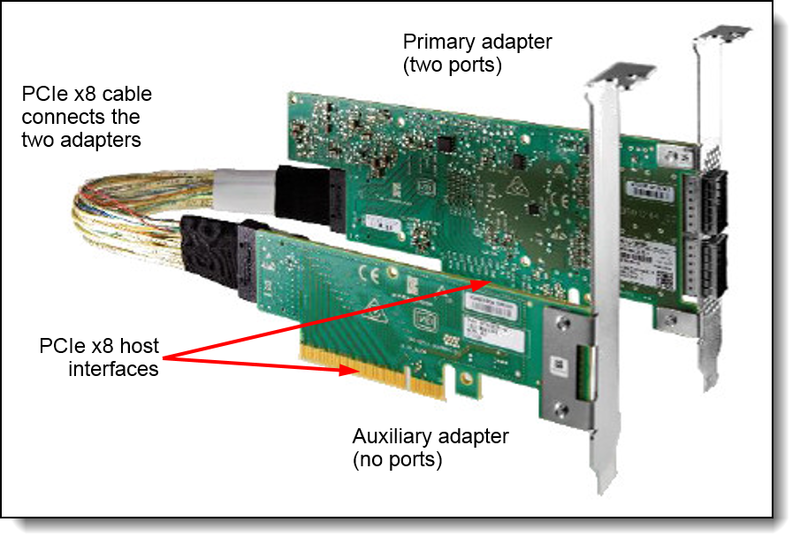 The Mellanox SharedIO Adapter and Auxiliary Card are shown in the following figure. The feature takes advantage of the design of the D2 Enclosure's x8 shuttle where the slots of two of the SD530 servers are adjacent. The primary and auxiliary adapters are installed in the slots as shown in the following figure. When the SharedIO adapters are installed, the other slots (1A, 2A, 3B, 4B) are reserved and are not available for use with any other adapters. The SharedIO adapters are not supported with the x16 shuttle. Ordering information for the adapters is in the Network adapters section. Each SD530 has two dedicated 10Gb ports routed to the 8-port Ethernet I/O Module (EIOM) at the rear of the enclosure as shown in below. The ports are connected to the integrated Intel Ethernet Connection X722 controller. Note: The EIOM is optional and can be deselected in the configurator. If the EIOM is not used, then the two 10 GbE ports are not accessible. The EIOM can be added later as a field upgrade. The ports are assigned as shown in the following figure. Note: No support for 10 Mbps or 100 MBps Ethernet connections. Tip: This port numbering is also located on a label affixed to the enclosure. See Figure 4 for the location. 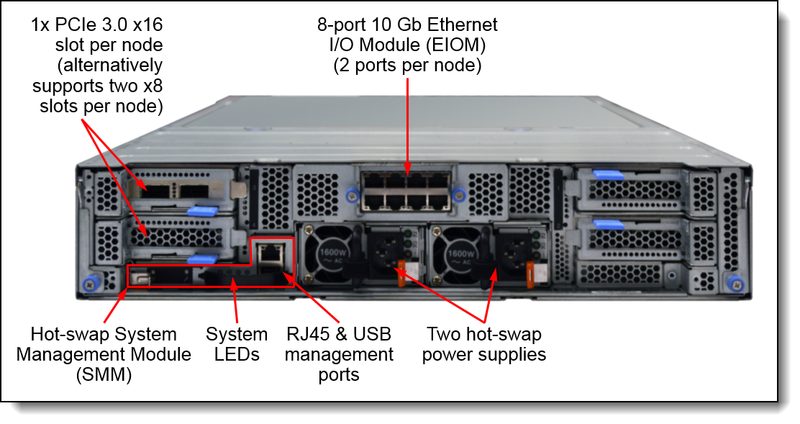 The 10Gb ports have either RJ45 connections or SFP+ cages depending on the EIOM selected. Ordering information is in the following table. The following table lists the supported SharedIO adapters. For details about these adapters see the SharedIO section. Note: SharedIO adapters are only supported in the x8 shuttle. They are not supported with the x16 shuttle. The following table lists other supported network adapters. PCIe x16 adapters require the x16 slot so only 1 adapter is supported per node. The following table lists the SAS HBAs suitable for connectivity to external storage. * SED support of the SAS HBAs is by using software on the server (SED commands are passed through the HBA to the drives). The following table lists Fibre Channel HBAs that are supported by the server. The following table lists the Flash Storage Adapters supported by the server. The SD530 supports GPU adapters with the addition of SD530 GPU tray. The GPU tray supports one or two double-wide GPUs. The SD530 server and attached GPU tray are show in the following figure. Two of these combined systems can be installed in the enclosure for a total of 4 processors and 4 GPUs in 2U of rack space. Ordering information for the GPU tray is as follows. The GPU Tray option includes the necessary PCIe cables to connect the two installed GPUs to the system. The GPU options, listed in the table below, include the necessary auxiliary power cables. The GPU Tray supports 2 GPUs, once connected to each processor in the SD530. Each GPU is connected via a PCIe 3.0 x16 connect routed from two PCIe 3.0 x8 connectors on the SD530 system board. See Figure 6 for locations of the PCIe connectors. Only the 4-drive SAS/SATA drive backplane is supported. The 6-drive backplanes (including AnyBay) are not supported. The optional KVM module is supported. The D2 Enclosure and Modular Enclosure come standard with two hot-plug power supplies and the power supplies act as a redundant pair ensuring that the enclosure remains powered even if one power supply fails or is disconnected. These AC power supplies are 80 PLUS Platinum certified for energy efficiency. The following table lists the supported power supply options. Two power supplies are standard and maximum. You cannot mix power supplies. The 1100W power supply is auto-sensing and supports both 110V AC (100-127V 50/60 Hz) and 220V AC (200-240V 50/60 Hz) power. The 1600 W and 2000 W power supplies only supports 220V AC power. In China only, all power supplies also support 240V DC. Power supply options do not include a power cord. For models of the D2 Enclosure and Modular Enclosure, the inclusion of a power cords is model dependent. Configure-to-order models can be configured without a power cord if desired. The enclosures have 5 hot-swap fans which are used to cool all components. In addition, each power supply has its own integrated fan. The fans are accessible by simply removing the panel on the top of the enclosure. Tip: The 80mm fans are hot-swap but you must first disconnect the cable before removing the fan. The SD530 server optionally supports local console support with the addition of the KVM breakout module. The KVM module is installed in one of the drive bays at the front of the server. 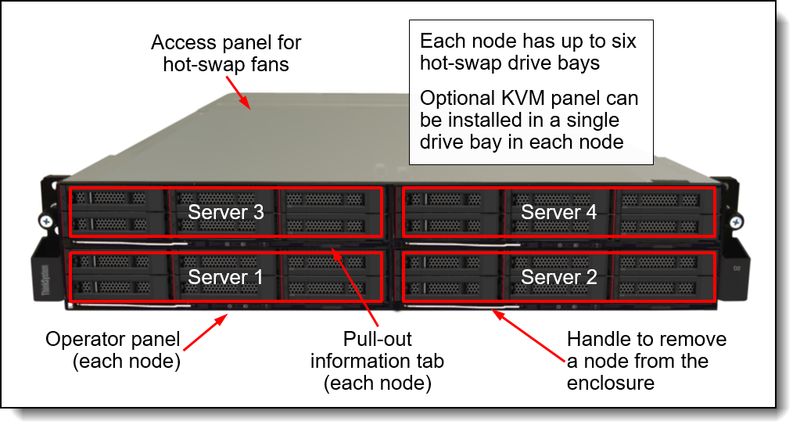 The KVM module is shown in the following figure. The Micro USB port is for local tethered connectivity to a mobile device running the XClarity Mobile app. This connection allows the app to connect to the XClarity Controller and provides additional status information about the server. See the XClarity Mobile section below for information. Ordering information for module and cable are as follows. The D2 Enclosure (machine type 7X20) includes a System Management Module (SMM), installed in the rear of the enclosure. See Figure 3 for the location of the SMM. The SMM provides remote management via a Gigabit Ethernet port of both the enclosure and the individual servers. The following figure shows the LEDs and connectors of the SMM. The Modular Enclosure (machine type 7X22) has a dual-port SMM standard instead of the single-port SMM. The dual-port SMM is identical to the single-port SMM except that the dual-port SMM contains two RJ45 Ethernet ports instead of one port and supports daisy-chaining. The D2 Enclosure can be upgraded to the dual-port SMM in the field using the option part number listed in the following table. The following figure shows the dual-port SMM on the left and the standard (single-port) SMM on the right. The dual-port SMM provides the ability to daisy-chain the Ethernet management connections thereby reducing the number of ports you need in your management switches and reducing the overall cable density needed for systems management. With this feature you can connect the first SMM to your management network and the SMM in a second enclosure connects to the first SMM. The SMM in the third enclosure can then connect to the SMM in the second enclosure. Up to 7 enclosures can be connected in a daisy-chain configuration, which means that with 4 servers in each node, a total of 28 servers can be managed remotely via one single Ethernet connection. Do not form a loop with the network cabling. The dual-port SMM at the end of the chain should not be connected back to the switch that is connected to the top of the SMM chain. The USB service button and USB service port are used to gather service data in the event of an error. Pressing the service button copies Fast Failure Data Collection (FFDC) data to a USB key installed in the USB service port. The reset button is used to perform an SMM reset (short press) or to restore the SMM back to factory defaults (press for 4+ seconds). The SMM (both single-port and dual-port versions) can be accessed though a web browser interface and via Intelligent Platform Management Interface (IPMI) 2.0 commands. In addition, a virtual presence (remote control & remote media) capability is also optionally available by upgrading each node's XClarity Controller. The available upgrades are XClarity Controller Advanced Upgrade and XClarity Controller Enterprise Upgrade. Preconfigured models come with either XClarity Controller Standard, Advanced or Enterprise, depending on the model. See the SD530 models section for details. The following table shows the field upgrades available for preconfigured models. 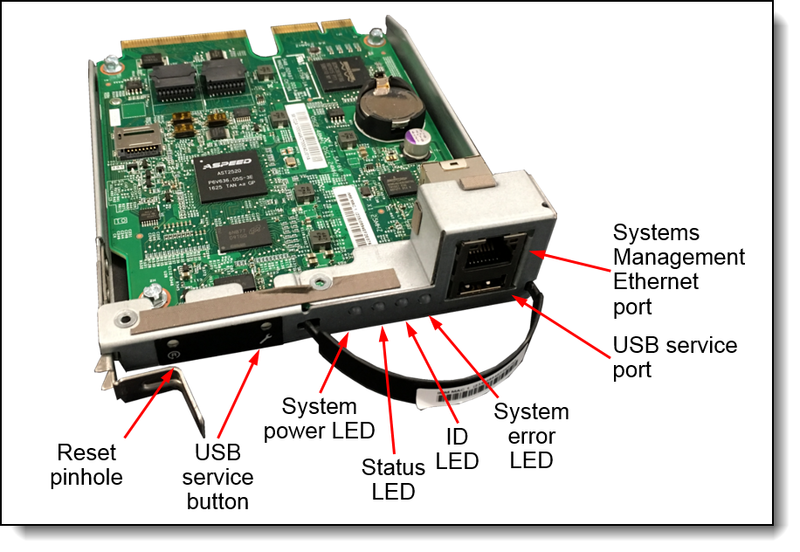 The plugin modules, available only for China customers, are installed in a dedicated socket on the system board, as shown in Figure 6. Ordering information is shown in the following table. Virtualization support: The onboard SATA ports in the server can be used with virtualization hypervisors, including VMware ESXi, Linux KVM, Xen, and Microsoft Hyper-V, however support is limited to AHCI (non-RAID) mode. RSTe mode is not supported with virtualization hypervisors. The D2 Enclosure and Modular Enclosure can be installed in a 19-inch rack cabinet. A rail kit is included in all models and can be included in configure-to-order models. Also available to order as an option is a cable management arm. Ordering information is in the following table. Supported Lenovo racks are listed in the Rack cabinets section. 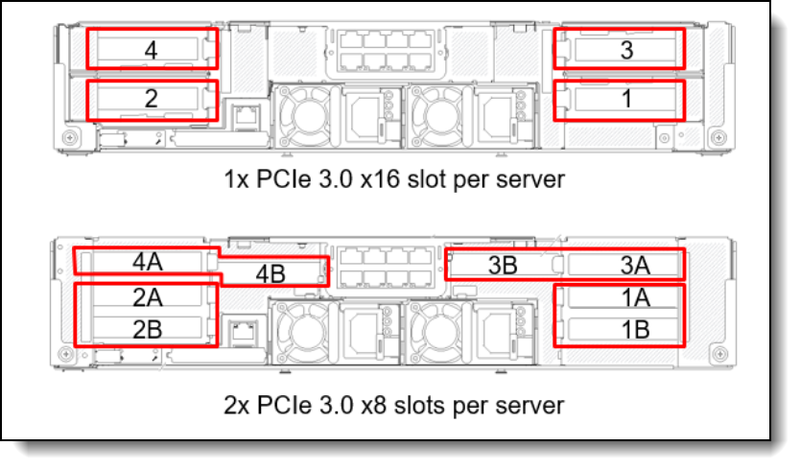 The SD530 server and the enclosures have the following physical specifications. The SD530 complies with ASHRAE class A2 specifications, and depending on the hardware configuration, the SD530 also supports ASHRAE Class A3 or Class A4 specifications. The SD530, D2 Enclosure and Modular Enclosure all have a 3 year warranty. Russia, Belorussia and Kazakhstan, EAC: TP TC 004/2011(for Safety); TP TC 020/2011(for EMC).